This story begins in a bedroom closet. It was there that a misunderstood, quiet, middle child from Ann Arbor, Michigan dreamt of being an emcee. It was in a bedroom closet where Andrew Kauffmann began to hone his craft, setting his flow of consciousness to music. It was there that he began to find his voice. Allow me to introduce you to an 18-year-old Ann Arbor native, a DePaul University student, a producer, and a rapper with a raw outlook on the reality of chasing dreams. He’s the charming artist with a cigarette behind his ear, the boy next door, the kid with a dark side you’ll only meet in his music, and one to never shy away from a challenge. “I feel like I have something to prove out here, I don’t want to be known as that white suburban kid who rapped more than everyone at his high school, I want to be known as a real artist,” Kauffman says. I’ve witnessed the humble journey and the delicate evolution of Kauffmann first hand — I’ve known the kid since he was ten years old. A quiet, yet observant kid found his purpose during a very malleable time; a maturation that was gradual, but worth the wait. He’s real — he doesn’t claim to have the same goals, struggles or fame as most emcees. I can attest to his humble lifestyle, and the honesty he presents as a lyricist. Kauffmann began his career in the bedroom closet of his friend Liam Quigley, a long-time comrade with a knack for writing hooks and producing music. Soon after, the Fake Lorist duo was born — Kauffmann the emcee, Quigley the producer. Before I knew it, the quiet kid making GarageBand beats in my basement turned into a poised, confident and charismatically cocky emcee and lyricist. He sticks to what he knows as a “privileged kid growing up in the suburbs.” His subject matter, while limited, is autobiographical, humorous and relatable. He spits indiscriminately, from tracks about his laidback, defiant lifestyle, to shouting out his high school sweetheart, to deep anthologies of his personal struggles. He won me over years ago with his metaphorical ability, and he has only evolved and improved as a lyricist. “Y’all was tryin’ to flow, but I’m the dam up in your aqueduct,” a line off of “Where The Ceiling Is,” is a perfect example of this. One of my favorite things about Kauffmann is his effortless ability to switch up his flow, yet keep it conversational, honest, and fierce. Not to mention his comical confidence, seen best on the track “Push Comes To Shove”: “They talk a lot, they wonder how far he could take this dream/you ain’t make the cut like you was runnin’ out of shaving cream,” is one of my favorite lines. Kauffmann arrived in Chicago last September for college, but he also arrived on the music scene, displaying a refined style and clearer message. Fast forward to April 2015. 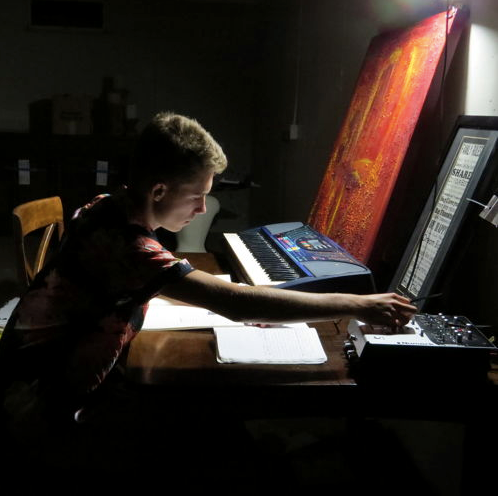 Kauffmann is wrapping up his first year as a college student in Chicago, and his first year as a serious artist. His next album, yet to be named, is due out in July. Kauffmann says to expect collaborations with Quigley, a.k.a. El Quigg, as well as fellow Chicago artists. Unlike his past projects, his next album promises to add depth and be more translucent, all while experimenting with a darker style. Kauffmann says the days of dropping straight punch lines and disconnected bars are over.